The recent royal wedding between Prince Harry and Meghan Markle left the studio abuzz with lots of beautiful brides requesting statement wedding crowns and veils for their weddings. We’ve always gone weak at the knees when it comes to accessorising a bridal look, and it was so exciting to see Meghan’s wedding look focus so heavily on her dramatic veil and wedding crown to frame her exquisite gown. And that gown? Can we just talk about that for a second? Oh my, what a glorious gown by Claire Waight Keller of Givenchy! We recently completed a beautiful pearl and gold wedding crown for the loveliest Sydney bride, Yasmine. Yasmine was inspired by the CAMBRIDGE and REINA crowns and was looking for a custom crown that pulled together her favourite elements. We were smitten with her lace wedding gown and sought to carry across some of the lace patterns from her dress onto her headpiece. That’s what we love about bespoke – the ability to bring to life our bride’s vision and also to incorporate elements from the rest of the bridal look for a more seamless finish. The end result? We adore it, and we’d love to hear your feedback too. The gold and light ivory colour palette feels fresh and inviting – reminiscent of a golden garden scrolling along a delicate wrought iron gate. This beautiful crown is delicate yet makes a profound statement of femininity with a nod to antiquity. An enchanting and ethereal piece that still feels modern and romantic. The delicate crown we designed for Yasmine would pair beautifully with a set of pearl drop earrings. The beauty of this piece is in its intricate and spacious detailing, creating a lightweight focal point that can be framed with our favourite earring sets – the BELLA, LOURDES, VALENTINE, MONTAGUE and PROVENCE pearl drop earrings. 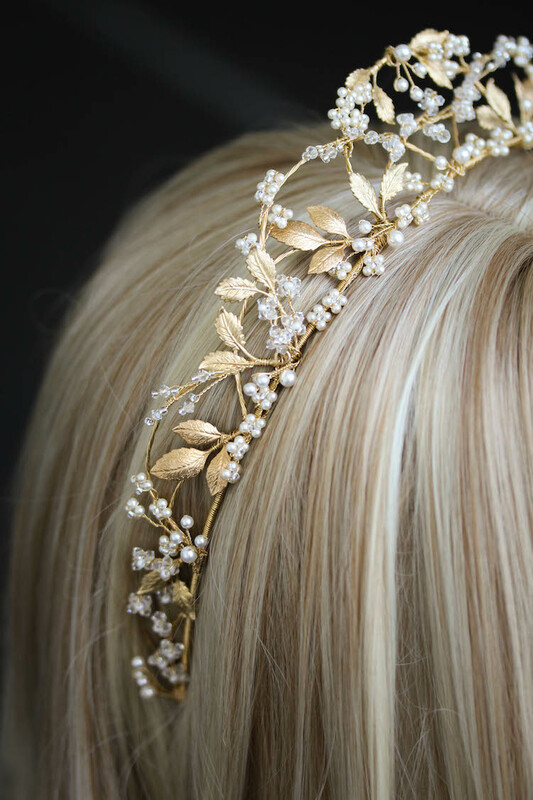 Pair this headpiece with romantic updos, all out bridal hairstyles such as loose curls, and half up hairstyles. Fancy a custom wedding crown? We love to work with our brides one-on-one to handcraft their perfect wedding heirlooms. If you’re inspired by any styles from our collection and would like them tweaked to better suit your style and vision, feel free to get in touch.